This is consistent with the definitions of the word figure, which have to do with both to form or shape and mathematical calculations. This basic concept is still present in the Chinese vocabulary that represents this idea. When 出來 comes after a verb, it means coming out, completion of an action, or the ability to discern or detect. (KTdict C-E dictionary app). 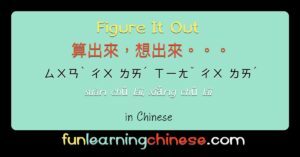 In Chinese, which bodily faculty is used to detect or discern or to “figure out” is a necessary part of the communication. Our puppy always figures out when I’m cooking. Oh, I figured out you are hungry! She figured out who he was. The child couldn’t figure out why his mommy wanted him to take a nap! They figured out how to make use of the computer. I still haven’t figured how to write this book! The kitten couldn’t figure out where the mouse was hiding. I can’t figure out which pants I want to wear. Hooray! I figured out my bank balance! Little by little, I will figure out more Chinese. I finally figured out how to sew this hat. Did you figure out what you want to eat for dinner? The phrase 想起來 means to remember, while 想出來 is about a newly problem solving something that was not known. On the podcast audio, my tutor reads just the verbs to help hear them. Here are a few more sentences to practice with. Since most of the vocabulary is translated in the sentences above, I will only add translations for the Chinese words that aren’t. I don’t remember you saying this. I will figure out what I want to do today. Did you figure out where you want me to go? I still haven’t figured out what I want to give my husband for his birthday. I have figured out how to learn to play the guitar. 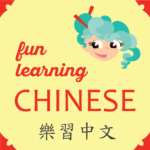 Just like when small children are learning to talk, when we study a new language it helps to sometimes listen beyond our current abilities, so here is a youtube video about Taiwanese coastlines that my tutor showed me. I found that I understood more as I kept listening. Glancing at the characters can sometimes help, but it can be distracting, too.